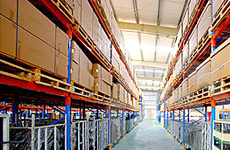 The intelliSTORE is an asset and warehouse management module which can operate independently. You can achieve the whole corporate stock control with help of this module. If integrated with intelliCMMS, this is capable to analyze the different stock movements in the maintenance point of view. It makes traceable the high valued and individually identified assets, and identifies the possible high strained places. The module contains the location and non-location based warehouse management too. The identification of the positions is easy with help of barcodes (1D, 2D) or radio frequency tags (RFID). The module has an optional integration with hand held computers. It provides the exact positions of the warehouse items on the picking list. Therefore the speed of material movement and the inventory process can be increase and the administration can be reduce significantly. The corporate personal card integration is also an option of our system. This will assign the stock movements with personnel. The system logs every operations and stores in encrypted secure format. It ensures the legal and audit compliance.